The White Buddha sits on a hillside above Pai. We left Chiang Mai, boarded a bus, and took a 3 hour ride through twisting mountain roads to the town of Pai. Pai has a definite 'hippie' vibe to it. Bare feet and dreadlocks, cool bars and funky cafes, beards and beads. Joe and I must be older than everyone else by at least 30 years. A bar gets ready for its evening customers. Our digs in Pai. We stayed out in the country, about a 5 minute drive from town. We spent Christmas Day poolside. Christmas Day lunch. We had a hankering for Western food so we indulged ourselves. Those burgers and onion rings did not disappoint. One evening, we hired a driver to take us to Pai Canyon to watch the sunset. The canyon is bisected by very steep, very narrow cliff walls. I got vertigo just watching people. In Thailand, it is customary to remove one's shoes before entering a home or shop. Even the doctor's office! Where is everybody? We had the pool mostly to ourselves every day. Mind you, the water was cold. But not to us hardy Canadians! 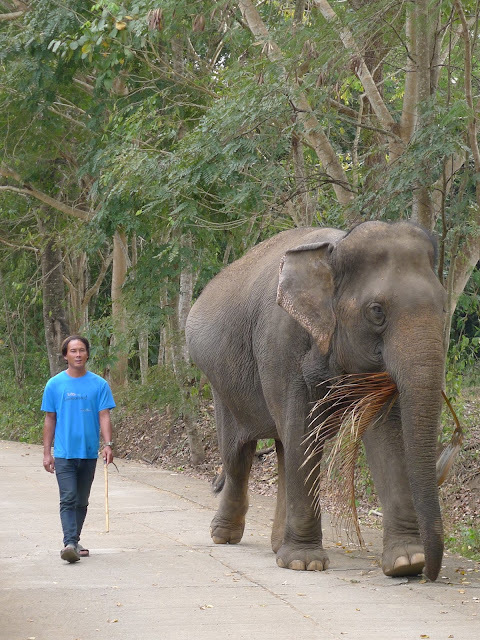 One afternoon, as we were waiting in front of our guest house for our driver, we saw a man and an elephant sauntering down the road. It was absolutely surreal! I had never seen an elephant before. I couldn't believe how HUGE this animal was! I motioned to the man asking if I could take a photograph. He nodded yes, I lifted the camera to my face, but before I could snap a pic the elephant crossed the road and walked right toward me. At first it felt a little scary. These animals are gigantic! She looked me straight in the eye and let me pat her trunk. It was an such emotional experience. And with that, she turned around and continued walking up the road. I will never forget that elephant and the effect she had on me. We are addicted to Thai massages! These women gave us incredible massages every single day. After each massage, they insisted on having a photo taken with us. As soon as the street bars start filling up at night, that is the signal for Joe and I to return to our room. This little guy spent the evening floating on an inner tube which was tied to the moorings of the bamboo bridge. A beautiful sunset over the nightly Walking Street Market. One night at the market, we saw a bride and groom. As we passed by, we congratulated them on their marriage. The next thing we knew, they pulled us in for a group photo. 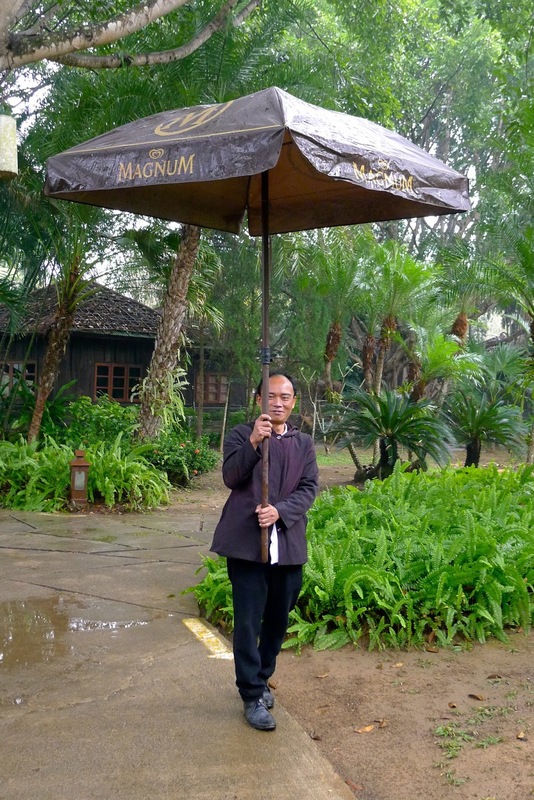 Now THAT is what I call an umbrella! This is how shops close up in Pai. With a string and two pieces of paper. Everywhere you look, you can see the White Buddha sitting high on a hill overlooking the town. There are countless stray dogs and cats in this country. 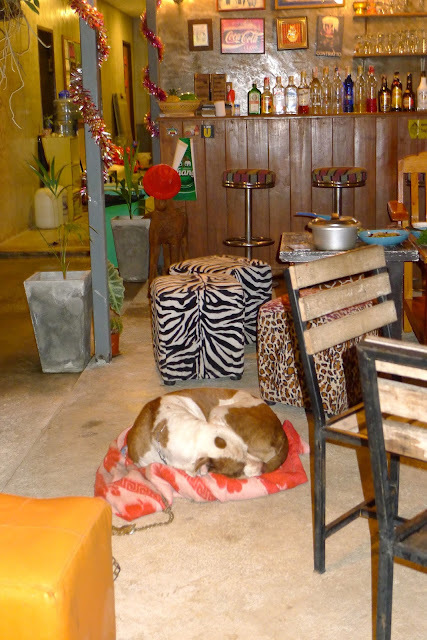 This restaurant owner was nice enough to put a blanket on the floor for this poor dog to sleep on. You can find dogs curled up on every street corner in every town. Thai food cannot be beat. We ate breakfast at this little food stall one morning. Our cheque came to 330 baht. Joe only had a 1,000 baht note. The proprietor had no change. He said to us, "Pay me another time when you get smaller bills." We did. That experience sums up Thailand perfectly. We had a wonderful stay in Pai. We met some incredibly friendly people, ate more delicious Thai food and saw many beautiful sights. We are heading out tomorrow to spend New Years Eve in Chiang Mai before we take a bus north to the Thailand/Laos border.